tous unis pour la legalisation du cannabis. Tunisia: Social Media Campaign to Legalize Marijuana Underway · Global Voices. Feb. 14, 2012 article. Citizens In Tunisia Using Social Media For Marijuana Reform | The Weed Blog. Feb. 15, 2012 article. Tunisians turn to Facebook in marijuana protest | memeburn. Feb. 16, 2012 article. Demonstration for cannabis legalization in Tunis - Encod.org. Video for Feb. 18, 2012 event. Tunisians to Protest for Decriminalization of Cannabis : Tunisia Live. Feb. 15, 2012 article about Feb. 18 event. Archived here, too. Tunisians Protest Against Various Issues in Front of National Constituent Assembly : Tunisia Live. "A Facebook page, entitled 'All united to pass a marijuana legislation,' had called for a protest on the same day [Feb. 18, 2012]. ... In actuality, protesters came bearing a whole array of demands and concerns, rather than just the condemnation of stringent penalization for marijuana usage and the advocacy of its legalization. ... Commonly referred to as 'zatla' in Tunisian dialect, marijuana has become a hotly debated issue since the revolution, which opened room for discussion on previously taboo topics. 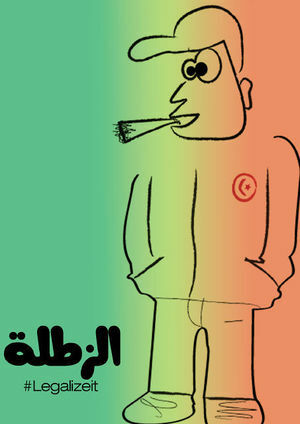 In Tunisia, a person faces a minimum sentence of one year in jail and a 1,000 dinar fine if caught consuming marijuana. Dejla Douissi, an actress in the famous Tunisian series 'Njoum Elil' (Stars of the Night), was present at the protest this Saturday and very vocal on the subject of zatla." Video below of Feb. 18, 2012 rally in front of the headquarters of the National Constituent Assembly (NCA) in Tunis. See Wikipedia: Tunis. This page was last edited on 23 March 2013, at 21:30.